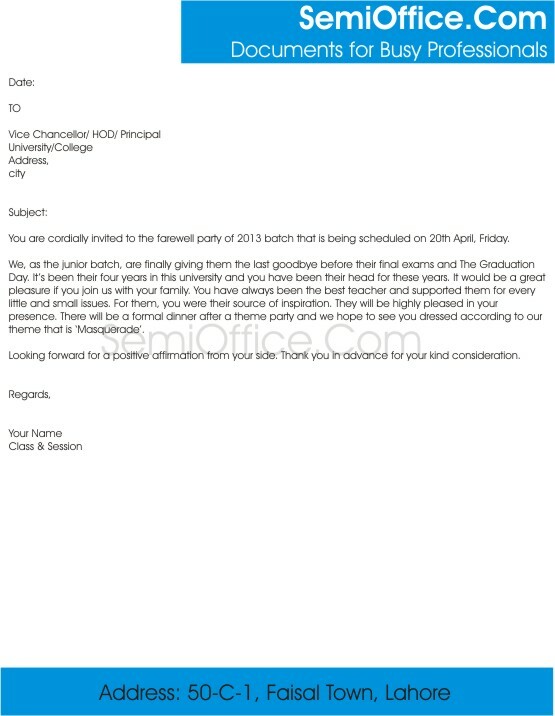 Invitation letter to Chief Guest for a Farewell Party of School, College and University. You can use to invite chief guest for any other party, program or events as well. Sample Invitation letter for chief guest to invite him/her in the annual function of school and address the passing out students with a short speech. 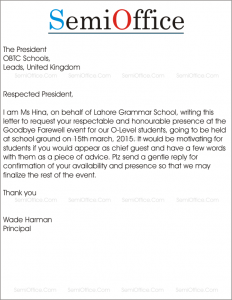 Format of Invitation Letter to Invite Chief Guest for School Annual Function is available for free download. 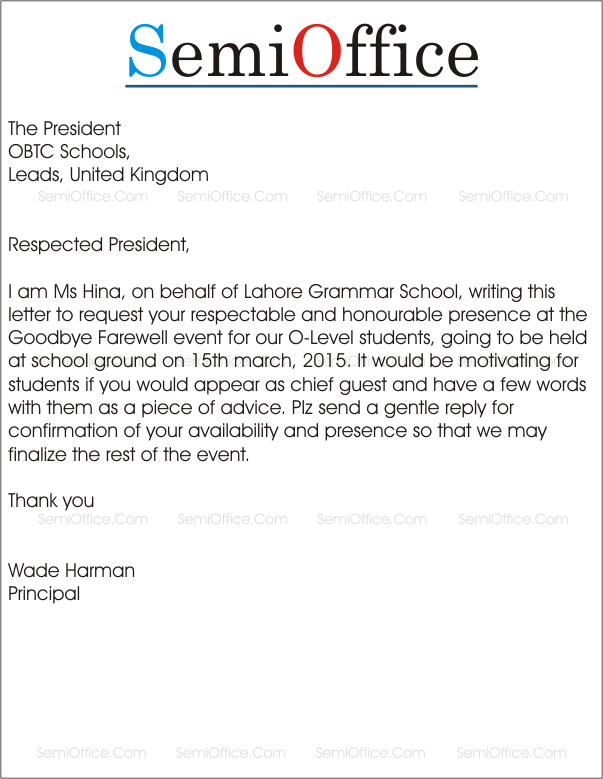 I am Ms Hina, on behalf of Lahore Grammar School, writing this letter to request your respectable and honorable presence as chief guest at the Goodbye Farewell event for our O-Level students, going to be held at school ground on 15th march, 2017. It would be motivating for students if you would appear as chief guest and have a few words with them as a piece of advice. Please send a gentle reply for confirmation of your availability and presence so that we may finalize the rest of the event. You are cordially invited to the farewell party of 2017 batch that is being scheduled on 20th April, Friday. We, as the junior batch, are finally giving them the last goodbye before their final exams and The Graduation Day. It’s been their four years in this university and you have been their head for these years. It would be a great pleasure if you join us with your family. You have always been the best teacher and supported them for every little and small issues. For them, you were their source of inspiration. They will be highly pleased in your presence. There will be a formal dinner after a theme party and we hope to see you dressed according to our theme that is ‘Masquerade’. Looking forward for a positive affirmation from your side. Thank you in advance for your kind consideration. Both are nice sample of invitation letter. I have found these application after searning a lot. Finally I found your sample letter which helped me.